The girls of the Chequers pub in Leominster. Text and photos by Owen Ogletree (founder/editor of www.ClassicCityBrew.com and founder/director of the Atlanta Cask Ale Tasting). "Herefordshire is God's own country - really the last bit of England that is still England." Pictured above is Peter Amor, the dedicated owner of the popular Wye Valley Brewery. The Wye Valley Bitter, Hereford Pale Ale, Butty Bach and various seasonals and bottled selections (like the excellent Dorothy Goodbody's Stout) are ubiquitous throughout the county of Herefordshire. Look to www.wyevalleybrewery.co.uk for more details. Barrels is well known as the best pub experience in central Hereford. Home of the Wye Valley Brewery tap, this pub is filled with friendly locals and has a welcoming front bar area and large outdoor seating facility out back (once the loading dock of the Wye Valley Brewery before the brewery moved to more spacious quarters just outside of town). This eclectic pub pours the range of fanciful ales from Spinning Dog including Hereford Organic Bitter 3.7%, Mutley's Revenge 4.8%, Celtic Gold 4.5%, and Mutts Nutts 5.0%. The bar has taken on the shape of an old ship, and mini-beer festivals are held here on a regular basis. This is a welcoming Wetherspoon's pub in central Hereford just across the street from the Merton Hotel. You can count on this chain of pubs to stock a range of cask ales unique from many of the other pubs in town. If you get carried away with your real ale sampling and forget to eat, don't despair - the Kings Fee serves great food late into the evening. This is a quaint old pub down an alley out toward the Cathedral. Food is available at lunchtime, and the range of 4-5 real ales is always top quality. The Merton offers reasonable rooms near the center of Hereford and within walking distance of all of the best downtown pubs serving cask-conditioned, real ale. The hotel's pub is very relaxing and usually offers one cask ale from Wye Valley. Due to a recent fire, this pub has seen quite a bit of renovation. Three or so real ales are on hand pump, and pub fare is available for lunch and early dinner. You must make the trip out to Bishops Frome to experience the delightful Green Dragon. The pub's owner, Simon Durrant, (pictured above) exudes enthusiasm for real ale and works hard to make regulars and visitors feel quite a home. Sips of the wide range of ales are always available to help one decide on a pint. 2006 Herefordshire Country Pub of the Year. This is a delightful old country pub that is filled with personality and fine cask ales. As one enters the front door, there is a small lounge and dining area to the left and casual pub to the right. During our most recent visit, the ales were top-notch. Be sure to check out the priest hole. This pub has more of a modern feel about it than other pubs in Leominster, and the cask ales are well kept. The bar has a horseshoe shape, and there is also a pleasant garden located out back. Chequers ranks as our favorite pub in Leominster. Every employee is personable and welcoming, the real ales are very enjoyable, and the food quite good. Inquire about the renovated, two-floor dining room in the very back of the facility. Chequers' atmosphere is deightlful. This pub was once a true "cider house" but now offers a homey atmosphere, cozy fireplace, pleasant conversation, fine ales and traditional English pub fare. Adnams Bitter is usually a staple at this eccentric, no-frills pub that is a short walk from the center of town. The casual, locals room is to the left with a more quiet lounge area to the right. This pub and B&B contains two bars, a dining room, and small outdoor seating area. Look for the pub to regularly stock a couple of real ales and some outstanding ciders. Pictured above is Steve Dunn, brewer and owner of the wonderful Dunn Plowman Brewery. The Olde Tavern in Kington is a must-see pub and serves as the brewery tap for Dunn Plowman. The small bar is extremely inviting and loaded with interesting nicknacks and interesting locals, and the pub has won numerous awards from CAMRA. Jake's Bistro serves local food items on the weekends in the rear of the facility. Fans of traditional, country ciders should be certain to plan a visit to the Dunkertons Cider shop just outside of Leominster. This is definitely a rustic, farmhouse operation, and the gift shop offers tastes and take-away bottles of all their fine selections - including the excellent vintage varieties. Live & Let Live is housed in an old pub in Bringsty Common that has remained vacant for a number of years. It is now open again, fully restored, and gaining a reputation as one of the UK's most beautifully revitalized pubs. Owner Sue Dovey is shown above pulling a pint of Wye Valley Butty Bach. Be certain to pay a visit to the Live & Let Live to support this new owner who has put so much of her heart and soul into saving this wonderful pub. Don't even think of visiting Herefordshire without including a meal at the amazing Stagg Inn. This award-winning pub, restaurant and hotel offers outstanding, gourmet cuisine and 2-3 real ales from Hobsons Brewery (maker of many of the best cask ales in the UK). The Hobsons ales make a delightful companion to the exquisite menu items at the Stagg. This friendly pub, located in the quaint town of Weobley, is quick with a friendly greeting, comfortable seat and a fine pint. Admire the original timbers, fireplace, and cozy outdoor patio. Read about the UK's Campaign for Real Ale (CAMRA). 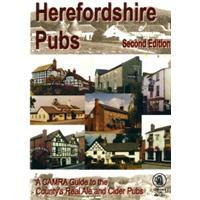 Visit CAMRA's Herefordshire branch to research all of the county's best pubs. Learn more about cask-conditioned ale (real ale).